People always ask me why I want to become an archivist, and I always respond with some idealized blanket answer that references the preservation of history and provision of access to everyone. My answers are always filled with such good will that I feel as if some heroic composition should be playing as I recite this declaration of my good intentions. Access is one of the top reasons why I am in this field but the other reason, the one that I rarely express, is that I just love handling all the cool old stuff. Looking at the correspondence of the celebrities of a particular institution, handling the old paper and coming across ephemera is like being Indiana Jones on an expedition. Most of the time my search does not result in a victory speech but there are times when what I handle fills me with excitement. This is one of the beauties of archives; we are not only saving what is important to an institution but we are also keeping in mind the potential users of this information and the unique things they might be interested in exploring. 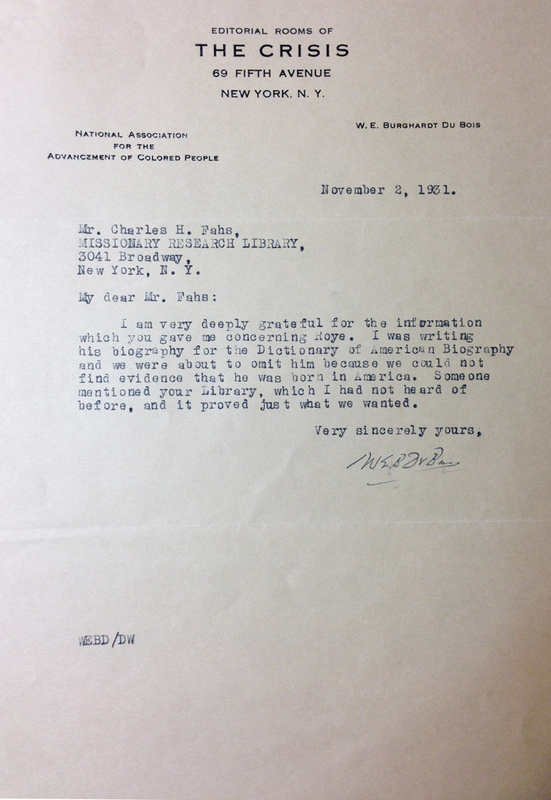 This past week while conducting an inventory of the Missionary Research Library administration records I came across library correspondence with W.E.B Dubois. At first, what caught my attention was the letterhead which read Editorial Rooms of The Crisis. For the past few weeks I have been working on an online exhibition of World War I records and I had used an image from The Crisis magazine. When I saw the name of the magazine, I did not immediately make the connection. The Crisis was an important African American publication in the early part of the twentieth century. W.E.B Dubois was not just the magazine’s editor but one of the founders of the National Association for the Advancement of Colored People. The influence that DuBois and the NAACP have had on African American rights is monumental. When I saw his signature across the bottom section of the page I was filled with excitement. I needed to know why one of the most important black leaders of his time was writing to the Missionary Research Library. In the first letter Dubois requested information regarding Edward J. Roye, the fifth president of Liberia. Among the information Dubois sought was the original birthplace of Roye. He stated that that he had already searched several resources and in another letter revealed that he turned to the Missionary Research Library as a result of a recommendation. The Library responds with enthusiasm over Dubois search and provides a list of resources that he needed. It was nice to see that the Missionary Research Library was performing remote reference way before the era of the virtual librarian. These libraries functioned as authoritative sources of information; sometimes they were the only source of particular information. 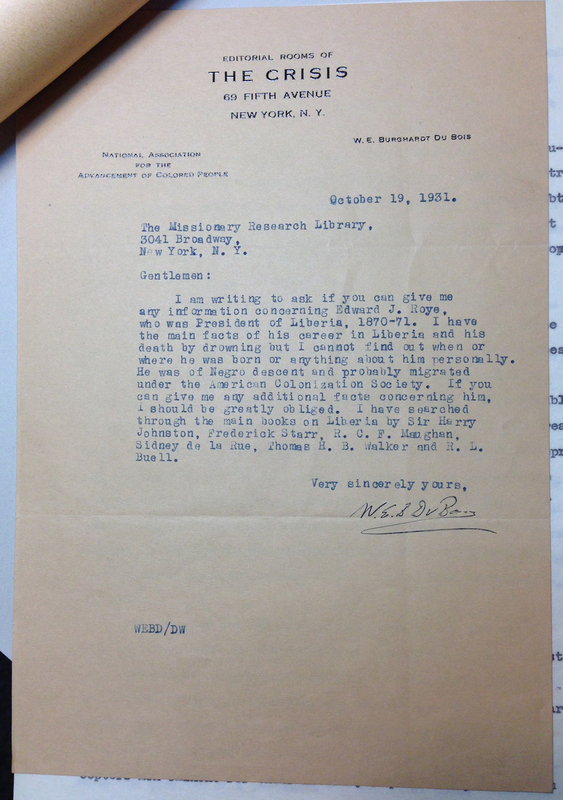 In Dubois’ case, the lack of assistance from MRL would have resulted in an omission from an important historical record. It was MRL to the rescue! Working with these records has allowed me to see the sheer volume and range of reference inquiries that the MRL received. The questions range from those about starting missions to bibliography requests concerning a particular country. Today, the Burke Library also follows in the footsteps of the MRL by providing access to information through its catalog and finding aids. Although the volume of written letters has changed as the result of technology, the Library continues to conduct reference and assist scholars with their searches. The librarian-to-person relationship has changed but the library still takes time to ensure that it presents itself as a people friendly resource. Sometimes the wealth of information becomes overwhelming and information gets drowned out. It is nice to find that my mission as an information professional to shed light on these interesting resources is still relevant. Note: The Missionary Research Library Administrative Records are currently being processed. Further information on the availability of this collection can be found online at: http://library.columbia.edu/locations/burke/archives/mrl.html. This entry was posted in Student Entry and tagged History, Missionaries, reference on November 22, 2013 by Rossy Mendez.